What a nice appetizer: a bunch of spicy, hot, crispy, buttery wings. Nothing says tailgate more than spicy hot wings but when football season isn’t upon us we are left with just grilling them for the sake of doing so. So let’s revisit one of the most fun spicy hot wing recipes I’ve ever tasted. Garlic and Parmesan Hot Wings. My most comfortable method for grilling wings is the indirect then direct method. This method essentially bakes the wings via indirect heat and then at the end you toss the wings over direct heat to get them crispy. 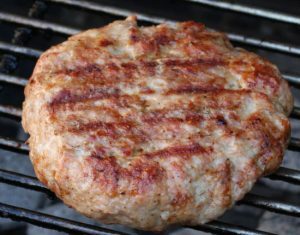 The general time frame depending on your heat is 30-45 min indirect heat and then 5-10 min of direct grilling. 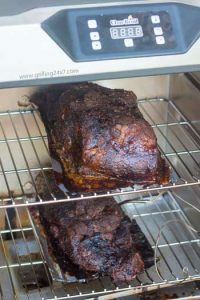 In the picture below the wings have started their indirect cooking and while this is going it is a great time to get the sauce going. To make the sauce I add together 1/2 cup of Franks hot sauce, 1/3 cup of butter, about 5-10 cloves of garlic (minced), a few tablespoons of Parmesan cheese, and a tsp or so of spicy chili powder. If you can’t find a spicy variety of chili powder I’d just use cayenne powder. 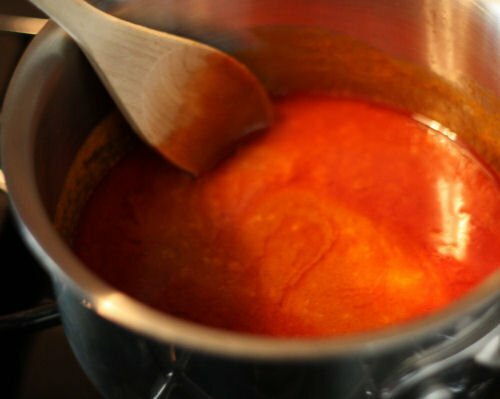 The above picture shows the butter and Franks hot sauce starting to simmer together. I use the garlic press for this job. 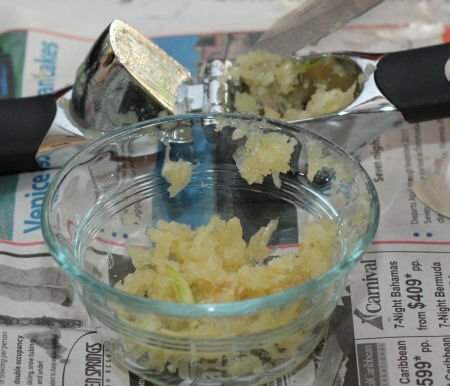 I soften the garlic cloves in the microwave and then take the skin off and mince them into a bowl. Then toss them into the sauce pan and add the chili powder. If you squint you can see the bits of garlic in the sauce in the above picture. Once the sauce is finished and the wings are almost cooked, move the wings directly over the coals for direct cooking. 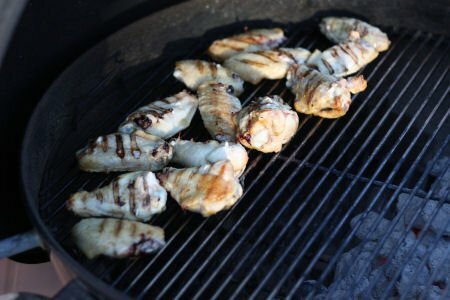 At this time the direct heat isn’t that intense so you can put the wings right over the coals, close the lid and give it a few minutes without fear of burning your wings. Then turn the wings and crisp them to your liking. Now is also a good time to stick the wings with a thermometer. Anything over 165 degrees F means you are ready to finish up and get the wings sauced. I carry out a bowl to the grill and put all the wings in the bowl. Then I carry the bowl back inside and dump the sauce over top. Toss the wings around a bit and then add a couple of tablespoons of fresh grated parmesan cheese to the top. This really gives a nice addition to the wings. 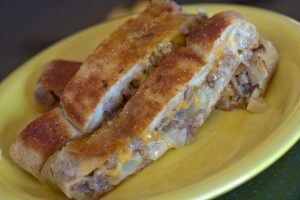 The Franks hot sauce and chili powder provides the heat while the butter gives that great texture. 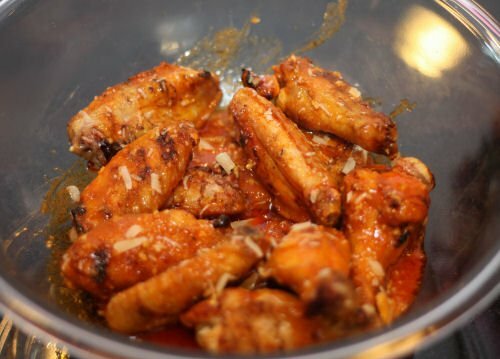 The garlic and parmesan cheese provide some nice depth to the classic spicy wing flavor. I love it! 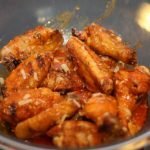 An amazing garlic Parmesan hot wing recipe. 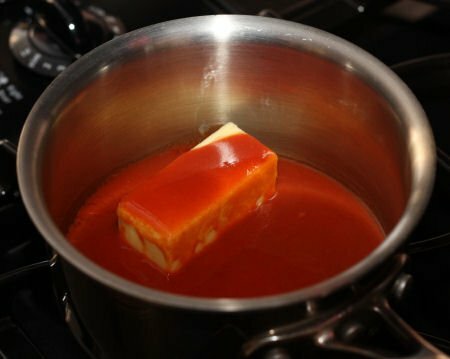 Add the butter and hot sauce to a sauce pan over medium heat. Melt butter. Add garlic and hot chili powder to your liking. Grill wings and pour hot sauce over top of wings. Sprinkle some Parmesan cheese over top.